The evening would start with a balmy mid-90s temperature and the sun beating down making a horrible recipe for an outdoor concert. As the music started the sun began to lower and it suddenly was tolerable, not great, but tolerable. The weather issues can be expected at the Crossroads in Kansas City. It is a great venue to see a show, it you are worried about the weather, just don’t go, or you can get on Back To Rockville and whine about it. Robert Ellis was the first artist on the four band bill. The band was a typical opening band; talented musicians that seemed to have not found their niche yet. They played some twang, they played some blues then they left the stage. Those Darlins followed with an interesting lineup of 3 women(bass, guitar, guitar) and one guy(drums) At some point all 3 ladies took singing duties in their set of garage rock. An energetic and fun performance that would have likely been better received in cooler weather or at least after the sun was all the way down. Next was Cowboy Mouth. Lead singer Fred LeBlanc came out with an amount of energy rarely seen on stage. Fred played the drums and sang and was one of the most entertaining acts I have seen. The set started and to get the crowd more into the show Fred demanded the crowd come closer. A steady beat was backed with Fred singing “one step closer” until the crowd was tight against the stage. At one point he even moved the VIP fence closer to the stage to get the GA crowd that much closer to the stage. I was impressed this guy knew how to work the crowd. After about 15 minutes of this I began to wonder if the band was going to play any songs. They had steady beats and antics with segments of songs but they were much more concerned with getting the crowd “into” the show than playing music. I realized that this wasn’t a concert; it had turned into a pep-rally. Fred even went into the audience and physically pushed members of the audience closer to the stage. The antics went over big with most of the crowd, obviously fans of the band. Cowboy Mouth fans, as always, remembered to bring their red spoons to throw on stage during “Everybody Loves Jill.” After a half-hour into the 50 minute set I was estimating that they had played about 4 songs. Late in the set Fred demanded the audience kneel in unison and all jump up at once; I did so not because I wanted to but because I was afraid Fred would come out and beat me to the ground with a group of psychotic fans of his band. A cover of the Rolling Stones’ “You Can’t Always Get What You Want” was thrown in for good measure, it proved true too; because all I wanted was Cowboy Mouth to get off the stage. Fred Leblanc’s bullying of the crowd continued through the end of the set never being overshadowed by their talent or music. Lucky Me! A Cowboy Mouth drumstick! Anyone want to trade it for a piece of pez? The headlining act was the Old 97’s and they took the stage at 11:20. This didn’t seem to shorten their set much as they tore through 21 songs. Cowboy Mouth entertained the crowd with their gimmicks and antics; the Old 97’s chose to do it by playing good songs. Rhett Miller came out slinging his guitar and tore in “No Simple Machine” from the shiny new album The Grand Theatre Volume 2. The band wouldn’t saturate their set with songs from the album however; they ended up playing 5 songs from it. The Grand Theatre Volume 1 from just last year would get almost as much attention grabbing 4 songs itself. Guitarist Ken Bethea seems to be the secret ingredient to the band. Ken’s guitar licks do much to give the band their signature sound that they have perfected at this point. Bethea’s guitar playing was a little less straightforward than I remembered in the past. He seemed to improvise a little more than previous shows. He and Johnny Hickman from Cracker are probably my two favorite guitar players to watch live. The brief two song encore featured “Wish The Worst” and the consistent closer for the band “Timebomb.” If your ever at an Old 97’s show and you hear “Timebomb” it is probably time to get ready to pack your stuff because the night is about over. The Old 97’s are a band that is so good live that I am always impressed. I don’t know whether it is Murry’s enjoying every moment on stage or Rhett doing his patent helicopter guitar strum but I don’t think I will ever be disappointed with a show by the band. The merch tent is always a fun adventure at a show with any money not spent on alcohol. The Old 97’s had a good selection of shirts but were out of larger sizes. This seems to be very common at shows. I don’t know why bands don’t order more large and extra large shirts to take on tour. Think about it; when was the last time you saw a sign at a show that said “Sorry, we are all out of small and medium t-shirts”? The good side of the merch tent was that there were autographed posters, always a hit with me. Since this was show #9 of 10 on this tour the poster were discounted too! So I picked up this nice little memento from the show for a lean $10. 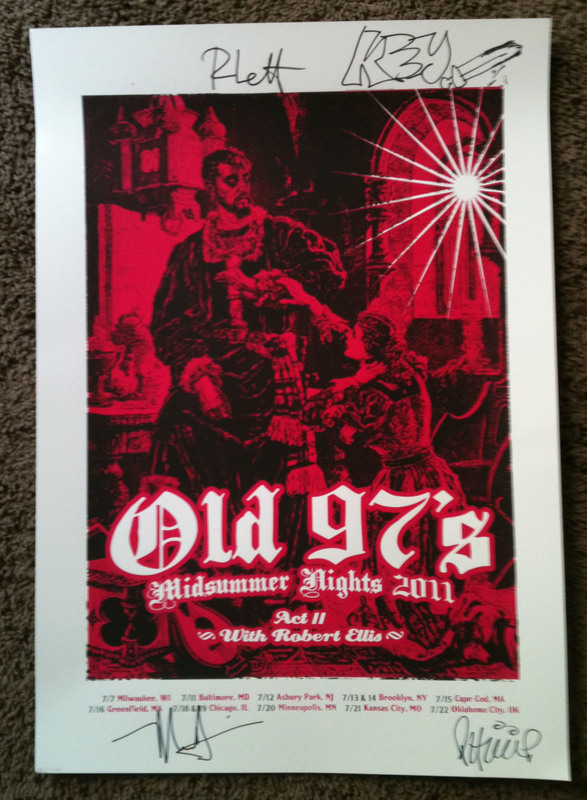 Autographed Old 97's poster, that is Rhett and Ken(with a sword drawn instead of his normal face) on top and Murry and Philip on the bottom. Here is the setlist for the Old 97’s on 7/21/11 at the Crossroads in Kansas City, MO. This entry was posted in Concert Review and tagged concert review, Cowboy Mouth, Crossroads, drumstick, Fred LeBlanc, Kansas City, Ken Bethea, Missouri, Murry Hammond, Old 97's, Philip Peeples, Rhett Miller, Robert Ellis, Those Darlins. Bookmark the permalink. Do you still have Fred’s drumstick?